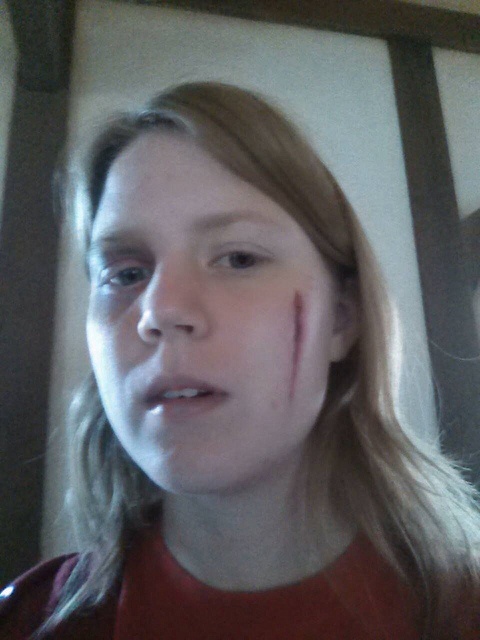 Me with a scar and black eye. Pretty good right? After that, all the girls wanted a scar just like mine. I heard the high schoolers were more interested immediately on Thursday, but alas! I was only there on Tuesday. Now of course we shoot ninja stars at anyone any time we have them. But we had a new addition this time. A mini crossbow that shot cotton swabs. It could also shoot other things, like toothpicks, but because of our audience we made it cotton swabs. The crossbow took us all day to make, and we only got one done. The guy in the video makes it look so easy. But it was definitely worth it. I plan on making one at home soon. The funniest part I think was that we brought computers to the Renaissance Festival. Computers to the Renaissance Festival. Overall though, the people enjoyed playing Palio and The Bridge that were both made by students here at UAT. It was a really good time, and if you ever attend here, I would definitely recommend volunteering for some of this stuff. You never know what might happen and what you might get out of it.